Wes Craig and Toby Cypress introduce a new team of defenders against supernatural monsters and the only thing standing in their way is bureaucratic red tape. 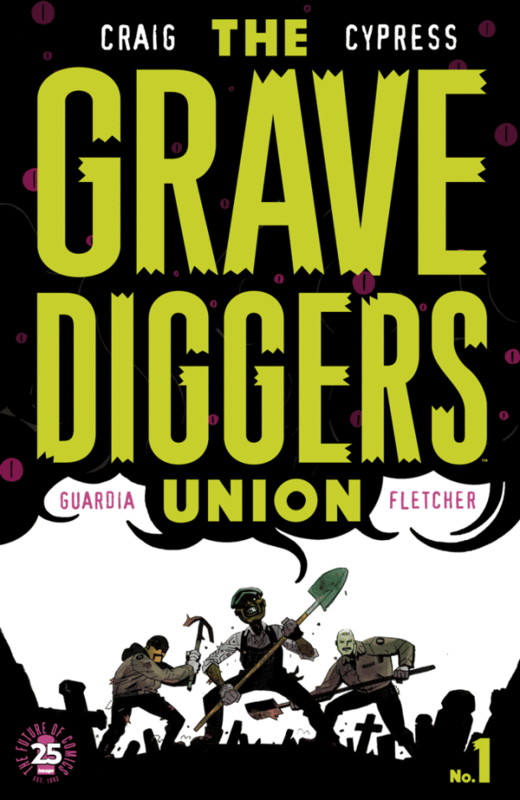 'The Gravediggers Union' is a horror comedy that celebrates the blue-collar warrior in a world threatened by ghosts, vampires, and zombies. After establishing in the first five pages that these supernatural forces have been in place on earth since the beginning with his own art, artist-writer Craig brings up to date with newscasts that reveal the plight of humans co-existing with these dangers and the role the Union has in it. We see first hand the Union is as invaluable as firefighters in protecting the citizenry. Lead by Cole who's the Danny "I'm too old for this sh*t" Glover of the group along with other veteran gravediggers Ortiz and Haley they battle an onslaught of zombies, vampires, junk golems and a ghost-storm. They have to fight these forces while also instructing their young gravediggers at the same time. Cypress' visuals are kinetic and cartoonish but also beautifully framed when the craziness subsides and Cole addresses his team. Cole notices the uptick in supernatural activity and is mightily concerned. He needs answers and the frequency of events is running his team ragged and getting more dangerous. It's causing a public health concern and one way to find out why this is happening is to seek the counsel of a witch. Morphea the witch could shed some light on what's going on but because of the charter by-laws, Cole is forbidden to talk to the witch without the approval from his Union chief. This is where the reality of bureaucracy hits and reminds me of 'Ghostbusters' being impeded by EPA agent Walter Peck. The last thing you expect on the threshold of the apocalypse is fighting red tape. But that's what makes this wild new story grounded and amusing because it focuses on the minutia, the details if an agency of blue-collar workers fighting monsters were bound by a Union charter. It also hardens Cole's resolve in getting answers to try to prevent a catastrophic event. Toby Cypress and Niko Guardia do a tremendous job in bringing this world to life but except for one major monster-fighting sequence most of the comic, an extended issue, is concentrated on the characters and their designs and colors are rooted in earth tones and down to earth locales like a greasy diner. It's a hard hat and lunch pail vision of monster fighters that we haven't seen before. 'The Gravediggers Union' was an unexpected joy to read. Instead of bombarding the reader with the usual onslaught of monsters and violence, Craig and Cypress make this uniquely compelling story about the people in the trenches, the first responders when supernatural phenomena occur. It sets up an unsanctioned meeting, a mysterious amulet, and the impending apocalypse. What more could you want?